The Royal Atlantic Condominium is a fantastic 40 unit condo building with only 4 units per floor! 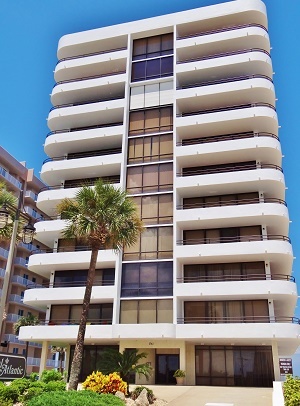 Units boast 500 square foot wrap around balconies and floor to ceiling windows in the living area, making this Daytona Beach Shores condo a must have! Units provide magnificent views of the Atlantic Ocean and Halifax River with prices starting under $300k! Two and Three bedroom floor plans are available. Located just south of the Dunlawton Bridge close to Crabby Joe's and the Pier. The beach can be accessed just off the pool area. This 10 story 40 unit complex has only 4 units per floor. Pets are not allowed and there is a 2 month minimum rental policy in place.